Teaching kids to sew can be fun! Taking teachable moments to understand the importance of knowing how to sew can provide your child with valuable tools later in life. There are a few simple steps you can take to make teaching your children to sew that will make it the most effective. Implement these steps over time as you practice with your child. The first thing you will want to introduce a child to is hand sewing. This can be as simple as making bean bags with small fabric squares or replacing a button. This instills the concept of how sewing works while not requiring the technical knowledge of a machine. Find ideas that are fun for the child to do. Whether it is creating a doll, a dress or gifts for family, make sure the child is learning and enjoying the process. Allow kids to keep working on techniques until it becomes easy. Use scrap fabric for practice and let them go at their own pace. When your student makes a mistake, tell them kindly that they need to fix it. Sometimes the stitching needs to come out and be done again. This is so that their work is not in vain - if they dont go slowly and correct mistakes, it simply makes more work later. Make sure they know how it will create a bigger mess to leave a mistake: stuffing coming out of a stuffed animal if the hole is not secure, for example. Sewing is a continuous learning process. Be patient with your child (and yourself) as you learn new skills together. The more you practice the better you will get. Teach your child to always use precautions with a sewing machine and needles. Have them keep their hands away from the needle, and make sure they always clean up the items when finished. See our sewing safety tips here. Everything needs to be pinned before sewing. Teaching them to remove the pins a few at a time will help keep the lines accurate and straight. Purchase a machine that has the basic stitches available, but that is still sturdy. Dont get one with all the bells and whistles as a beginner machine. Make sure to keep it clean and dust free so that it will last for years to come. Having a quality machine will make learning easier for your child. Here is what to look for in a sewing machine. The best sewing results will come when you wash and dry your fabric before beginning your project. This will allow any variations in the fabric to get worked out before stitches make it a committed project. 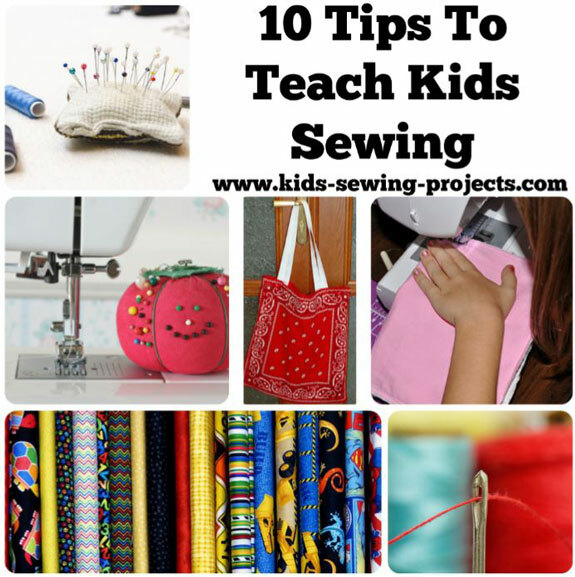 Teaching your kids to sew can become a great hobby for you to share together! Just use some simple steps to make it fun and enjoyable, while still teaching basic principles.